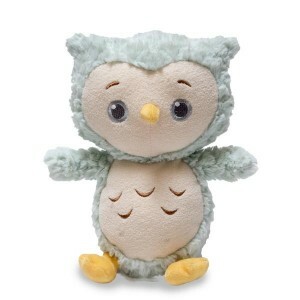 This animated singing Owl flaps his wings and lights up to "Twinkle Twinkle Little Star" and "Hush, Little Baby". 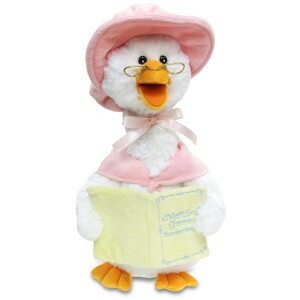 This Tendertyme 100% cotton 5-piece matching gift set includes a body suit, bib, pants, hat and socks for the little one. 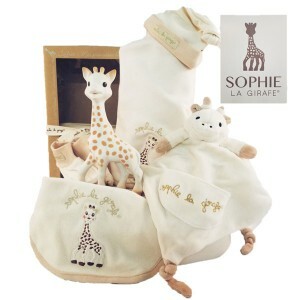 Accompanying the gift set is a large plush giraffe in matching colours. This set comes in blue or pink. 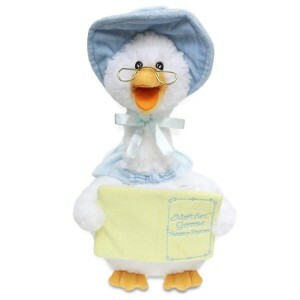 The Tendertyme 100% cotton 5-piece matching gift set includes a body suit, bib, pants, hat and socks for the little one. Accompanying the gift set is a large plush giraffe in matching colours. This set comes in soft green or pink. A stylish little gift. The Tots Fifth Avenue gift set includes a knitted cardigan and hat. To top the gift off it comes with a matching knitted bear. This set comes in pink, blue or white. This cute gift includes a set of Lady Jayne melamine dishes for the baby and is accompanied by a cute plush lamb. This animated singing Pig will read the classic fairy tale of the "Three Little Pigs" This cute pink plush pig comes with 4 finger puppets. His colorful scenic gift box can be converted into a fun play prop for the puppets by punching out the windows and doors. The popular baby toy giraffe comes presented with a soft receiving blanket. It is delivered with an authentic Sophie gift bag and card. 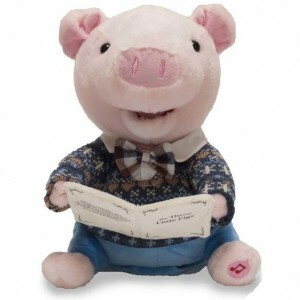 Sure to delight the parents and the child receiving this gift. 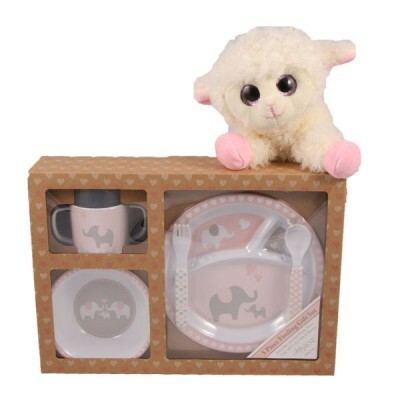 This keepsake wooden gift box is filled with a cute plush lamb, set of clothes, plush blanket, set of 3 receiving blankets (100% cotton), and set of 10 terry knit wash cloths. 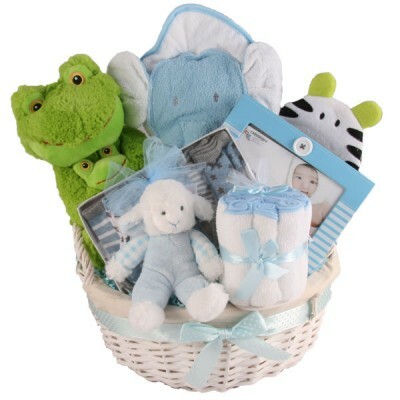 This gift basket is filled with a soft plush frog, soft hooded towel, bath mitt, set of wash cloths, set of socks, picture frame and a rattle toy in a white wicker basket. 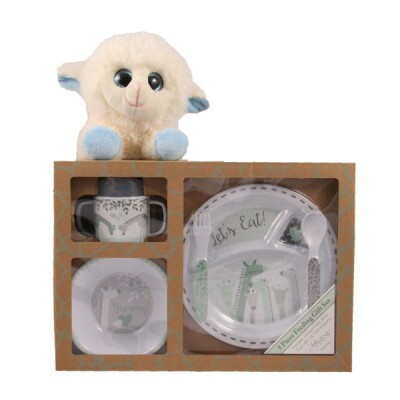 The popular baby toy girafe comes presented in a gift box. 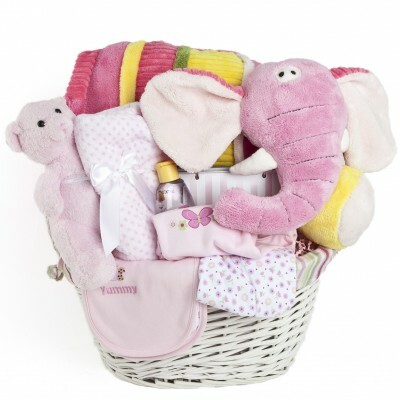 The essentials to welcome baby into a world of softness and comfort!